ublic Work portfolio of sculptor Lee Imonen. 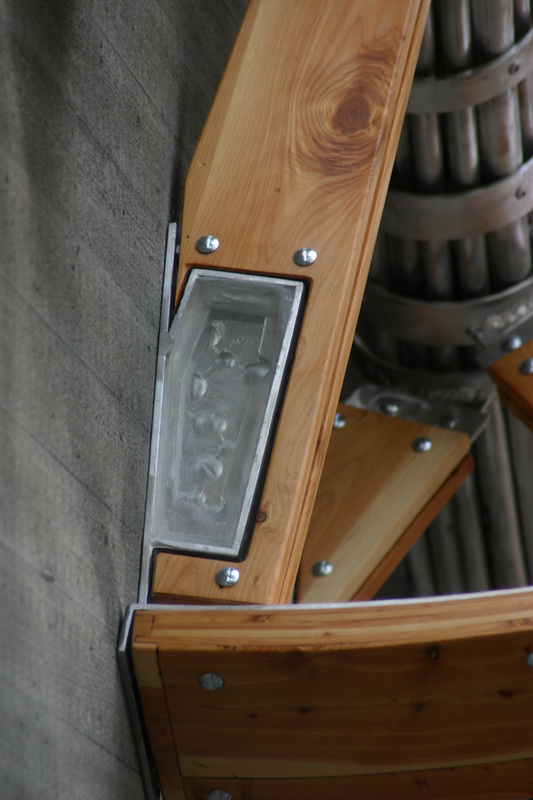 The central structure supports a series of ‘frames’ which contain castings of imagery relating to the subjects being taught within the building itself. 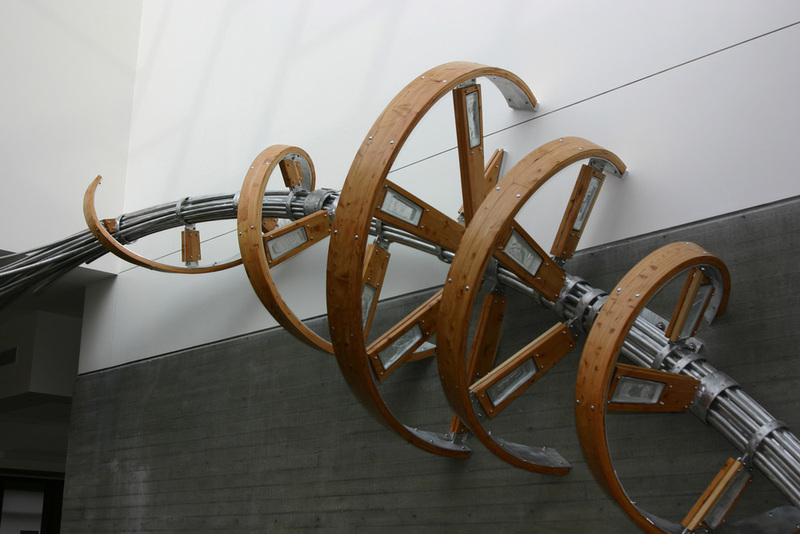 The frames serve as enlarged slide mounts, with the castings being imagery taken out of its laboratory or environmental context and enlarged, allowing the audience to get up close and personal with each subject from a new vantage point. Designed in part as a response to the interconnected volumes and the cantilivered forms within the building itself, Integral Framework is intended to heighten the sense of visual continuity within the building by elaborating on the sense of flow or movement. he design process for Basin was initially undertaken as an opportunity to develop a dynamic solution to the practical matter of functioning as a teaching tool for the steel connections course taught through OIT’s Civil Engineering program. 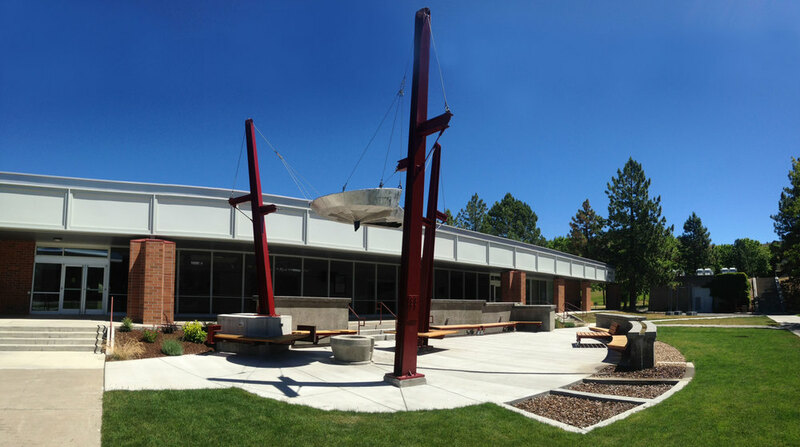 Although the sculpture does utilize of the twenty-four structural connections taught in the AISC Connections Teaching Toolkit, Basin’s form is intended to provide a dramatic presence in front of Owens Hall serving as a landmark, meeting place, outdoor classroom, and a visual reminder of the larger landscape of which the campus is a part. Bountiful references the tradition of Native American net and weir fishing in the Northwest region, specifically throughout the historic floodplains and side channels of the Willamette River. The sculpture’s extended metaphor expresses both the time honored and renewed commitment to the natural and restored environments. This reference is likewise intended to shed light on the City of Eugene’s long-term investment in the restoration of the Delta Ponds Wetlands and fish passage. It is this recognition of cultural tradition combined with a renewed awareness of our limited resources that I hope will result in a continued stewardship of our natural areas. The brimming net of Bountiful represents the hope and tireless energy that has gone in to the return of this balance. The design for La Grande Weir resulted from and extensive research phase in an attempt to develop a more complete understanding of the Grande Ronde River Valley and its cultural history as a gathering place in the sparse eastern Oregon environment. The valley has drawn people to its shelter and resources for thousands of years. White settlers later moved into the valley for the same reasons, and the university continues to draw people together for the purpose of education. The dormitory plaza became an extension of this concept of gathering place. Understanding this place’s history and current role resulted in developing a visual metaphor around the concept of “gathering place”. The form for “La Grande Weir” is referential to a Native American fish trap. In this case, the traditional form has been exaggerated and enlarged, so that the community itself is gathered within the space. At a scale of 100ft by 60ft and 37 ft tall, the weir becomes its own architectural space, providing a sense of location and shelter within the context of the campus buildings. The sculpture reflects not only the history of the setting, but also the role or function of the place and the way in which people will continue to interact within it. 2003 Oregon Percent for Art Commission, North Mall Office Building, Salem Oregon. Sampo was designed as a response to the thematic foundation of the North Mall Office Building. This was the State of Oregon’s first public building to use sustainable architecture principles. 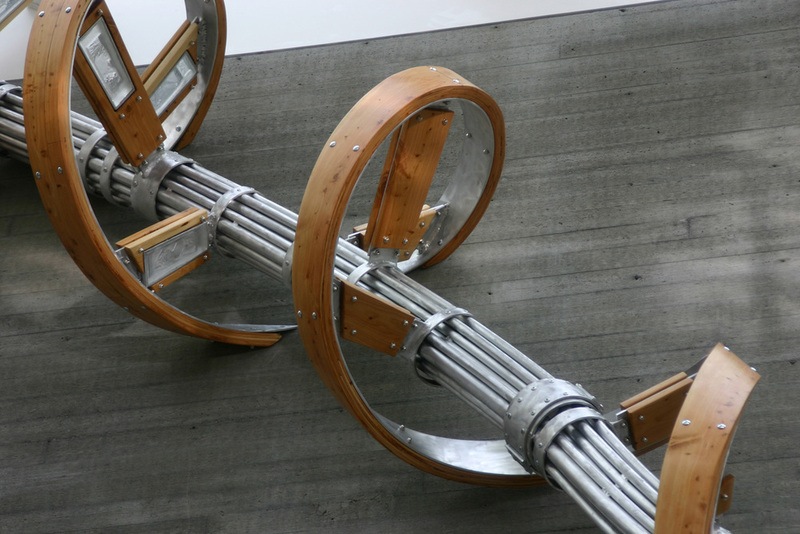 The theme of sustainability is carried out in the work through both its material and concept. The piece is made from fire-salvaged cedar and second use steel. The sculpture’s theme references a story from Scandinavian book of mythology, the Kalevala. The story recounts a mythical harvester, given to the people of the north by the gods to better work in concert with their challenging environment. Standing 36 ft tall, the piece incorporates seating elements and functions as a semi-sheltered space that provides a human scale to the broad, open plaza.